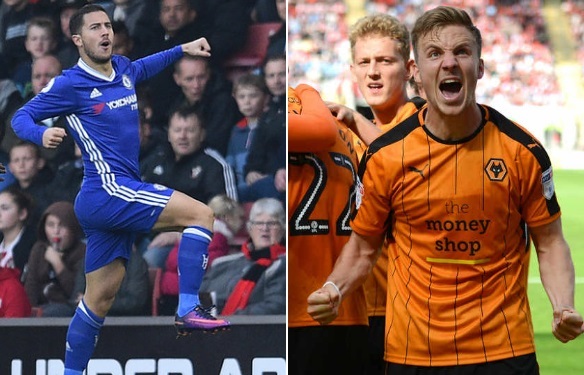 Chelsea visited Molineux Stadium on Saturday evening for the FA Cup fourth round tie against Wolves. Hoping for a easy win, Chelsea were in for a surprise as Wolverhampton made it difficult for the current premier league leaders and it took midway through second half to finally break the deadlock with Chelsea scored thanks to Pedro Rodriguez goal. Wolves however pushed for the equalizer all the way to last minute and made a game of it for most part. 65′ 0 – 1 Pedro Rodriguez scored midway through the second half to put Chelsea in lead. Chelsea have put themselves in superb position in the premier league having won 14 of the last 17 matches they sit top of the table with 60 points, 8 clear off second place City and Antonio Conte can afford to play full strength side in FA Cup and go all out on for domestic league and cup double. Team News & Lineups: Wolverhampton are in the relegation battle currently sitting 18th (of 24 places) in Championship and having disposed off Stoke City and Liverpool in previous rounds Paul Lambert will fany his team’s chances against Chelsea. We can expect a strong side with Helder Costa and Bodvarsson upfront hunting for goals. Chelsea on the other hand will be without Marcus Alonso, David Luiz and John Terry due to injuries while Fabregas should start in midfield alongside either Kante or Matic. Willian to partner Pedro and Loftus-Cheek in attacking roles behind Batshuayi or Diego Costa. This is how I expect both teams to lineup on Saturday. Match Predictions: Chelsea are playing some amazing football and even the top premier league sides have been unable to figure out their 3-4-3 system and I expect Wolves to struggle even if Conte makes several changes. Wolves do have pace going forward and they might nick a goal but Chelsea have too much firepower and should outscore Wolves regardless. I am going with a comfortable 3-1 win for Chelsea in this one.